In the new issue of integration, Björn Hacker discusses the potential of the European Pillar of Social Rights to strengthen the EU’s social dimension. Andreas Wimmel analyses how far party positions in the 19th German Bundestag on the European Commission’s proposal for the deepening of the Economic and Monetary Union correspond with the parties’ economic policy guidelines. Stefanie Schmahl chronicles the development of the European Union’s asylum and refugee policy and gives a critical assessment on the current reform initiatives. Olaf Leiße applies his own concept to explain the different results of the EU’s efforts of Europeanization in the Southern Caucasus. 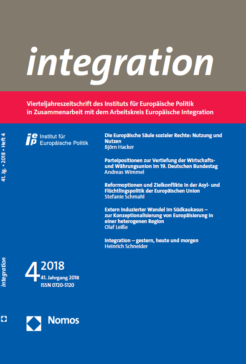 With the reprint of the article “Integration – gestern, heute und morgen” the Institut für Europäische Politik commemorates Heinrich Schneider, who passed away on 1 April 2018 after being the editor and later on the chair of the editorial board of integration for many years.